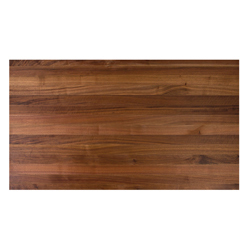 Maple Cherry and Amrican Black Walnut counter tops 1-1/2" 2-1/4" 3"
Options: 4" Stainless steel backsplash material (5-1/2" OAH) drilled for attachment to counter or wall. 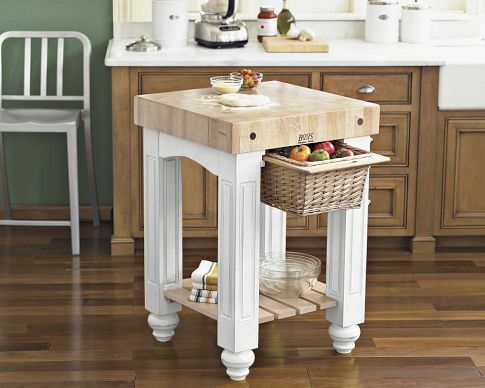 More than just a countertop: Butcher block countertops are a perfect melding of beauty and function. Made from hard rock maple or Appalachian red oak, these natural solid-surface tops impart a warm friendly glow to any kitchen. 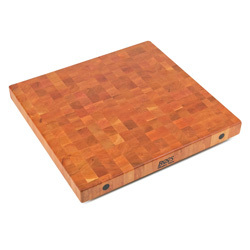 Ultra Premium Countertops: The Logical Choice Chefs prefer butcher block maple for all slicing, dicing, and chopping duties. Bakers choose it for preparation and rolling dough. 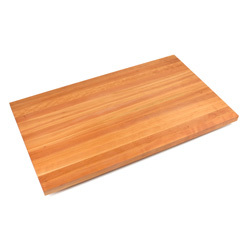 No other countertop surface offers the functional advantages of butcher block, and they are priced far below other solid-surface tops. 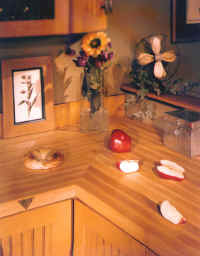 The Beauty: Butcher block countertops add a natural warm beauty to complement any decor. Like diamonds, variations in color and grain patterns make each top unique. Hard Sugar Maple: Northern sugar maple is one of the hardest and most durable woods known to man. 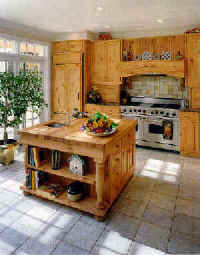 Nearly 115 years experience building quality butcher block assures you of a kitchen countertop that will last a lifetime. Easy Care: The penetrating oil finish can be quickly wiped clean with a damp cloth. If scars or stains do appear, they can be easily removed by sanding the area. 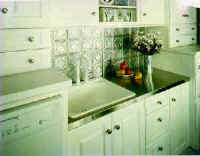 An application of mineral oil brings the area back to like-new condition. 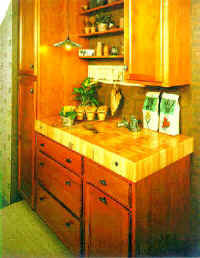 Your solid wood countertop is the only area in the kitchen with a renewable surface.